This two-story luxury condo located on the seventh and eight floors of the elegant Matapalo complex. Belongs in a movie from Hollywood! The lower floor has two bedrooms with a balcony and the upstairs has a separate kitchen, two more bedrooms and a Jacuzzi on the balcony. This incredible condo has the feeling of being in a dream. 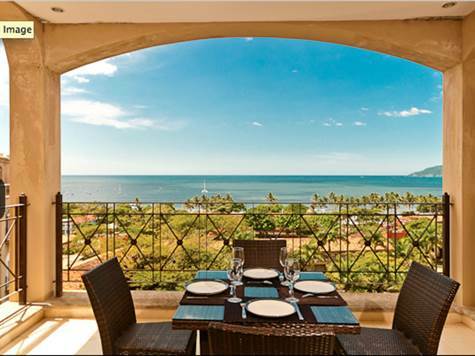 Tile floors with an in-lay border detail on both levels, floor to ceiling glass doors onto patios that lead to a breath taking view of Tamarindo and the city. The view gives such a sensation of flying that you will find yourself reaching out for something to hold on to. Below the balcony is an exotic tropical garden that surrounds the pool. In the near distance, Tamarindo beach, lined by royal palms bordered by white, flat sandy beach. On the first level there is a fully equipped state-of-the-art kitchen with beautiful granite counter tops that adjoins the living area. Very open and practical, the kitchen includes a flattop electric stove, oven, large double-door refrigerator with an ice dispenser, a dishwasher and all the necessary items to create and enjoy your favorite meals. A half bath is located between the kitchen and the main door. Arched doorways with stone columns lead from the main living area to two bedrooms located on this lower level. Each room has plenty of natural light, has spacious closets and its own private bath. The bedroom located on the front side of the building has two sets of sliding glass doors; one leading to the common terrace and another that opens onto a private patio and a panoramic birds-eye-view. The bedroom on the other side has large windows that over look the same view as the two huge balconies and coastline to the south. But the most spectacular part of this space is still to come. Located in the living area a stone staircase spirals up to a second level of true luxury.